Dr. Michael Scharf is a Professor and the O. Wayne Rollins/Orkin Endowed Chair in Urban Entomology at Purdue University. He received his Masters Degree in Urban Entomology and his PhD in Insect Toxicology from Purdue University. Afterward, he completed a postdoctoral fellowship at the University of Nebraska. Mike worked as a Research Associate at Cornell University, a staff member at Purdue University, and a faculty member at the University of Florida and the University of Nebraska before joining the faculty at Purdue. Mike is here with us today to tell us all about his journey through life and science. Dr. Michael Scharf was born and raised in Northern Indiana. After graduating from Chesterton High School in 1986, he entered Purdue University as a freshman in Agriculture. In 1991 Dr. Scharf received his BS in Urban Pest Management, and then decided to stay at Purdue to earn his MS and PhD degrees, respectively, in Urban Entomology and Insect Toxicology (1993 and 1997). 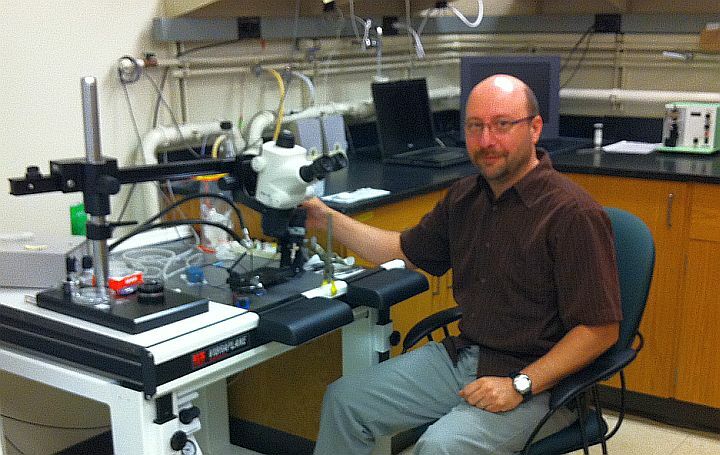 During his PhD program, Dr. Scharf also spent a semester as a visiting scholar in the laboratory of Dr. Janet Hemingway at Cardiff University in Wales, U.K.
After graduate school, Dr. Scharf held two separate post-doctoral positions; one at the University of Nebraska-Lincoln (1997-2000) and the other at Cornell University NYSAES in Geneva, NY (2000-2001). From 2001-2004, Dr. Scharf was Director of the Industrial Affiliates Program in the Urban Entomology Center at Purdue University, and then from 2004-2010 he was an Assistant and Associate Professor in Insect Molecular Toxicology at the University of Florida, focusing on urban pest insects. In 2010, Dr. Scharf re-joined Purdue University as the O. Wayne Rollins / Orkin Endowed Chair in Urban Entomology and Molecular Physiology. He is the first chaired professor in the 100-year history of Purdue Entomology and presently is one of only seven named professors in Purdue’s College of Agriculture. Dr. Scharf’s primary research interests relate to characterizing biochemical and physiological adaptations in insects that drive evolutionary divergence, particularly those with “real-world” significance in urban pest management. Insect toxicology provides the perfect platform for investigating such evolutionary divergence, especially the topic of insecticide resistance. Dr. Scharf’s other interests relate to improving our understanding of long-standing mysteries in insect physiology and biochemistry, such as termite caste differentiation, symbiosis and lignocellulose digestion / assimilation. Dr. Scharf currently oversees a laboratory composed of undergraduate, graduate and post-doctoral researchers who are actively pursuing the topics noted above, and others.